Explore the beauty of this pristine land beneath the shadow of Himalayan Mountain. Discover your potentials of serving the community by participating in different programs like health care, teaching, psychological counseling, monastery and childcare volunteer program in Nepal. Participate to volunteer in Nepal with FDIP ! FDIP offers various meaningful volunteer abroad projects in Nepal, including Healthcare Volunteering, Volunteering for Conservation, Teaching Projects, Orphanage and At-risk Children Volunteering and Teaching in Monasteries. Nepal is a remote south Asian country. Nepal is renowned as country of Mount Everest and birthplace of Buddha. Though most of the places of this country are rural, remote and hard to reach every year people around the world arrive here to have a glimpse of rare natural beauty and cultural variety. And many of the visitors don’t only come as a tourist but they love to live with the Nepali by getting close insight of Nepali lives. 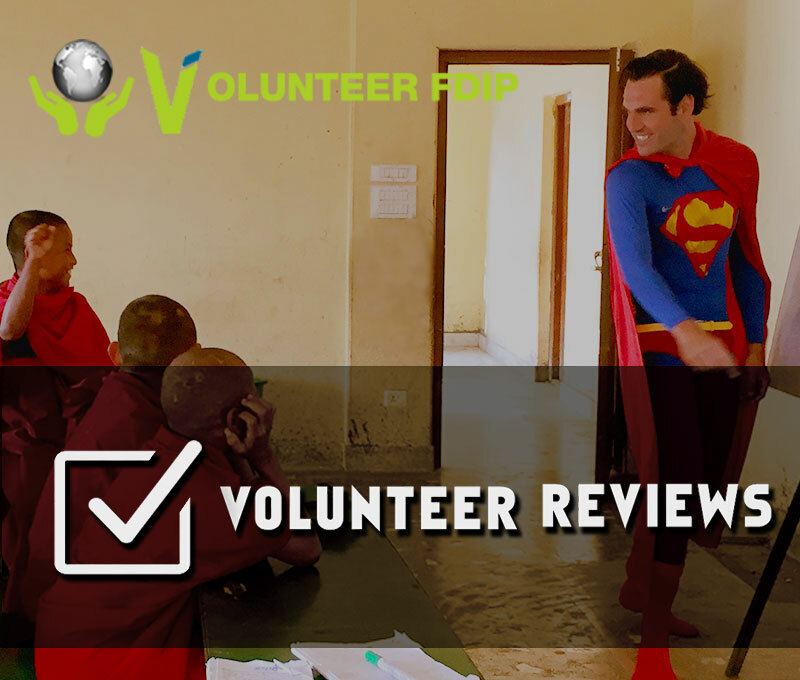 Volunteer FDIP needs your participation to make each and every volunteer projects effective. We need volunteers to execute every program to head towards it's missions. Without volunteers we cannot do what we do. Volunteering in Nepal is definitely emerging as a meaningful life experience for the people around the world , as it provides opportunity to explore the majestic land of Himalaya while making some contribution to the people of rural communities. For a least developed country like Nepal the major health concern remains limited to the physical health issues and thereby psychological health remains ignored. With increasing socio economic turbulence, the country is suffering with the inclining rate of psychological issues on its citizens. Limited psychological professionals and therapy and counseling centers are providing the service for the inevitable element of health issues. In such scenario, volunteering is counseling and psychological services can be an opportunity to enrich your experience in mental health service while providing invaluable contribution to reduce this problem from Nepalese society which is affecting the social life of exponentially increasing rate. Moreover, due to recent devastation of Nepal Earthquake in April 25, 2015 and its aftershocks, Nepal has noticed increasing number of people suffering from psychological problems and trauma. Participate as a Volunteer for Psychological Counseling & Hypnosis with FDIP and assist the professionals in their psychological therapy process. By joining our counseling psychology programs you will enhance your understanding of the psychological conditions in least developed countries like Nepal and also will be able to provide your skills and knowledge to bring some improvements to the situation. Whether you are professional or seeking careers in psychology services or just a student or trainee in a Psychological Counseling & Mental Health, volunteering in this project will add new dimension to understanding psychological condition of an entirely different world. Volunteer work for orphans and disadvantaged children is one of the most effective and worthwhile opportunity while volunteering in Nepal. Spending time and interacting with these children can soothe your soul and mind, meanwhile for those children it is a time to learn something you are good at. We focus on creating an environment for the development and growth of these children and your participation is the one that will make it possible. As a volunteer your role will be to make some contribution to improve the attitude and learning ability of these children. Some of them might have lost their families and some of might have faced their days without basic needs. So you’re positive vibes and caring attitude towards them can motivate them with move forward in life and give a confidence to achieve a better future. Volunteers are not supposed to have any specific skills or mastery in volunteering work. We expect them to have volunteering motives and a loving and caring heart for these children. Volunteer will help these children in their daily academic learning and provide the sanitation instructions. Music, art and creativity development, sport and athletic instructions and any other form of your talents can also be a good way of contribution. Volunteering in daycare centers is another dimension of childcare volunteering. These kids need your support for a better future. Learning is not only about going through the course books and academics it’s about interacting with different people and culture from different people. FDIP is initiating this program to provide the daycare centers of Nepal to acquire your volunteering for the improvement of learning ability of the kids there. Also, Nepal is a developing country and many daycare centers here lack the system and techniques like that of developed nation. In such cases your instruction and exchange of experience can play a crucial role for the improvement. As a volunteer you will help with various academic and fun activities such as writing, recitation, rhymes, songs, music and other extracurricular activities. You are not expected to be an experienced master of daycare centers. But basic knowledge and experience with kindergartens and daycare centers will be appreciated. If teaching is part of your interest and you want to make some contribution of your knowledge to the local and community schools then this affordable volunteering in Nepal might be project of your interest. Writing on blackboard with piece of chalk, you will help develop learning practice of students in Nepal. Your enrollment as a volunteer to teach mainly will be for English teaching as English in second language of Nepal and most of the students are poor in this language. Besides that if you are interested you can also teach Mathematics, General Science, IT, Art and Creative Education. As a volunteer of FDIP you will leave a very positive impact on the students of local schools of Nepal. Your contribution of English language skills and knowledge of other subject can turn out to be a breakthrough for the future opportunities of these students. In Nepal teachers are termed as "Guru" and considered as gods. So being a teacher while volunteering in Nepal definitely will be a respectful and glorious experience for a participant. Nepal is also known for its biodiversity. Many conservation centers, sanctuaries and national parks are playing their role for wildlife conservation. You can participate as a volunteer of FDIP in these conservation projects. You will be working in Annapurna Conservation Area, Shivapuri Conservation Area, Chitwan National Park and Bardiya National Park as a conservation volunteer. Natural resource conservation: Volunteer will be working with conservation bodies working in Nepal for natural resource management, renewable of alternative resource implementation and resource utilization awareness. Volunteers can also participate for their research works on natural resource and conservation education in various institutions of Nepal. Environment conservation project: Global warming and climate change is a global issue from few years. Both developed and developing countries are have been suffering with the environmental issues. Nepal is also struggling with soil, water and air pollution from last few years. As a volunteer of FDIP you will be joining hands with few active environmental conservation groups of Nepal to assist them with their mission. You will be participating in activities like collecting rubbishes ( glass, plastic , cans ) , river cleaning projects , environmental awareness and education campaigns and community activities. Health is a major issue in Nepal. Still many Nepalese lose their lives because of minor diseases like diarrhea, jaundice and dengue. Country is coping with the challenge of reducing infant and maternal mortality rate. Volunteering in Nepal for medical and healthcare services will make you a part of this mission of minimizing health challenges in Nepal. As a FDIP medical volunteer you will be working in various fields of medical and healthcare services to gain medical experience abroad. You can help medical representatives of hospitals in the field of general health services, nursing, dental services, ENT, orthopedics, ophthalmology, x-ray, and ultrasound. But you have to let us know your particular interests when you apply so that we can make arrangement s for you to volunteer in that specific area. Depending on your interest you can take part in outreach programs organized by the local hospitals. Volunteers may also be needed to be part of awareness campaigns of general health and sanitation issue. People in villages of Nepal die of dehydration when they suffer from diarrhea as there is misconception among the people that drinking water can cause more loose motion. In rural areas people follow traditional treatment or indigenous system of healing. Your participation can play a crucial role in the awareness campaigns. Sharing your medical skills and knowledge can be a life savior. Volunteer with Buddhist Monks in Nepal. Discover the elegance and peace inherited by Kathmandu valley in its Buddhist monasteries at various locations. Grab a singular opportunity to work closely with Buddhist monks. Learn about Buddhist lifestyle, culture, religion and language. And more importantly, share your knowledge and skills with them to improve the life standard of these monks. Volunteers will mainly teach English to monks in monastery schools. Enhancing their English communication via speaking, writing and reading skills can be a big support for them. Improving their education will enable them to connect with the world and approach for new opportunities for a high quality of life. On the other hand working in monastery is a once in a lifetime opportunity for you. Experience of working in peaceful environment of monasteries will pacify your attitude and you will feel the change in the way you look through the life during the process of learning Buddhist culture, tradition and beliefs.Volunteering on this project will definitely make a positive impact on you enrollment on this volunteering in Nepal project will worth few good memories. There are many communities and group of people in rural areas standing behind the line of opportunities as they are not being able to make their footsteps due to lack of skills and knowledge. This project is aimed to empower the member of such communities. Volunteer FDIP works with local NGOs and communities to uplift the situation of members. Volunteers will also work alongside local people for different community development initiatives such as construction and improvements of infrastructures, women empowerment, sustainable and scientific agriculture practice, education and healthcare awareness programs, sanitation and pollution minimization campaigns. By helping the members of rural communities, our aim will be to make them self dependent, responsible and skilled. Community development projects aim to develop the infrastructure of targeted community for its present and future generations. Nepal is perfect destination to turn your vacation into a meaningful travel opportunity. Participate in the volunteer works at rural areas of Nepal which will of course make your experience an everlasting memory. When you are free from volunteering, you can discover the majestic beauty of snow capped mountains, jungles, rivers and lakes. There are different options of exploring Nepal. Trekking To The Himalayas: Most of the visitors in Nepal are attracted by the fascinating views of Himalayan ranges and come here to explore some of the most magnificent mountain vistas on the Planet. Highest mountains, deepest gorges, dramatic routes and spectacular views, Nepal offers all ingredients for a perfect trekker. Explore World Heritage Sites: Delving into the colorful city Kathmandu is the next choice of Nepal visitors. City is always glossing with many heritage sites listed in UNESCO such as three squared palaces namely Patan Durbar Square, Bhaktapur Durbar square and Basantapur durbar Square, Pashupatinath- one of the biggest Hindu pilgrimages , Swayambhu and Boudhanath- most devoted Buddhist shrines. Travel in Nature: Unravel the natural mysteries in beautiful cities like Pokhara and Chitwan. Pokhara is a picture perfect city with lakes, mountains and rivers. City is always in mild weather, never too hot and never too cold. The spectacular view of reflection of mountains in the lakes while boating and calm wind for the paragliding is the main attracting factors for domestic and international tourists. On the other hand Chitwan is known for its sublime forest and is a sanctuary to wildlife, you’ll encounter with various Asian species such as rhinos, elephants, crocs, tigers, reptiles and birds. Witness Chitwan’s wildlife with Jeep safari, Elephant riding or safaris by foot. Catch cultural performance by traditional Tharu people and you’ll be fascinated to discover how hospital, fun loving and vibrant they are. Adrenaline rush: Nepal is also a place for adrenaline rush. Fast flowing rivers are for rafting and kayaking, high hills are for exhilarating bungee jumps and sky of Pokhara are always ready to look colorful with Para gliders.